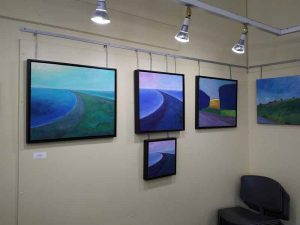 I’m thrilled to be having a solo show of my art in the Yorkville Library gallery during March. It’s a wonderful spot — a brightly-lit sunny room at the back of this historic location. 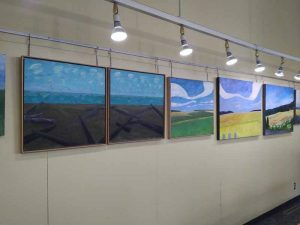 Here are a few of the installation views of the show. It’s surprising how much work it is to put together a show like this. It makes me appreciate the work a commercial gallery does! First, I have known of this date for about a year, because I had to apply for the space more than a year ago. I had gone in and measured the space to see how much room there was. As the time for the show comes closer, I started worrying I did not have enough work that met my standards for being good enough to show. A few pieces were reworked, and repainted. In one case, The Yellow Fields, I am thrilled with how the finished painting came out, after feeling it was not quite right for months. I also started and finished a few pieces just in the last few months. And everything needed to be mounted or framed, have wires put on it, titled even! There’s a lot of second-guessing of oneself. “Is it good enough?” So now it is hung on the walls, shared with the world. The librarian in charge of that branch told me how pleased she was to see larger paintings, as they are often quite small. And it really brightens the whole space! 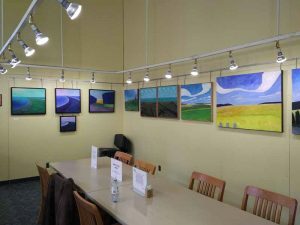 There are a number of libraries in Toronto that make their space available for art exhibits, and I think this is such a wonderful way to use the library system, in addition to all the other great stuff they do. If you are in the Toronto area, I hope you drop by to see the work, “in person.” All of it is here on the site. This entry was posted in Behind the scenes, News on February 28, 2017 by Susan. 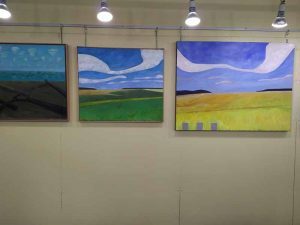 I was thrilled to have the Toronto Public Library Special Collections get in touch with me this year and enquire about purchasing two paintings. These are both recognizable locations in a nearby area of the city that was at one time the town of Leaside. The top piece is an old building at Todmorden Mills, which is now a public space. I deliberately distorted the perspective on this lovely old building, which had such pretty colors in the stucco. The lower one is part of a cement plant, in the Leaside industrial park. I am very interested in these industrial spaces that are part of the city, as they are fast disappearing. 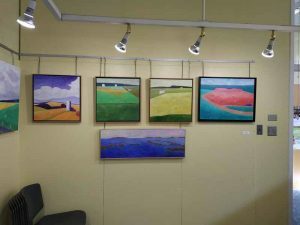 Both pieces are now in the permanent collection at the Toronto Reference Libary! This entry was posted in News, Uncategorized on January 12, 2014 by Susan.